Cal Poly senior right hander Joey Wagman struck out nine batters in his final start at Bagget Stadium. The Mustang beat Cal State Northridge 5-1 to open their last home series of the year. Wagman allowed one run over seven innings, and Cal Poly scored five runs off Matador ace Jerry Keel, who only lasted three and two-thirds innings. The Mustangs entered the bottom of the third trailing 1-0, but scored four runs in the frame to take the lead, two of which came on a two out, bases loaded double by Elliiot Stewart. 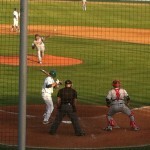 Northridge intentionally walked the previous batter David Armerndariz in order to pitch to Stewart. An intentional walk to David Armendariz set up Elliot Stewart’s two run double. Armendariz ended the game by making a diving catch on a ball hit, according to Armendariz’s mother, by the left fielder’s best friend. 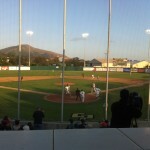 Cal Poly added another run in the fourth on a double by Nick Torres, who also drove in two runs. Wagman worked out of a bases loaded, one out jam in the sixth by striking out consecutive batters looking. Wagman struck out the side looking in the inning despite allowing three singles. Mustang closer Reed Reilly entered the game in the top of the eight in a non-save situation with a runner on first and no outs. Reilly struck out the side in the eighth and struck out two more Northridge batters in the ninth. The game ended on a diving catch by Armendariz in left field on a ball hit by his high school teammate, Northridge first baseman Josh Goosen-Brown. The win improved Cal Poly’s overall record to 35-16 and Big West Conference record to 13-9. The Mustangs are tied for third in the conference. Northridge (31-21, 15-7) is in second place in the conference, but has a lower national ranking than the Mustangs. Cal Poly will host Northridge at 1 p.m. on both Saturday and Sunday and then travel to Stockton to take on Pacific for the final three games of the year.